ETS train from Ipoh to Butterworth is one of the popular train routes in Malaysia. Both cities are among the popular cities in Malaysia. They are also popular among tourists coming to visit Malaysia. Ipoh is located in Perak and Butterworth is located in Penang. The two cities are situated to the north of KL. Taking ETS train from Ipoh to Butterworth is the locals’s favorite choice of transportation especially during festive seasons. The heavy traffic jam on the North-South Expressway is common during this times. Taking bus or driving your own car will surely take longer time and tire you out compared to travelling by train. 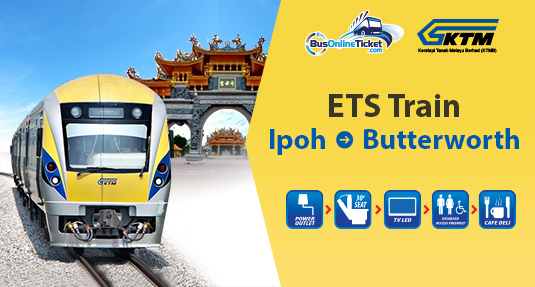 Therefore, ETS train tickets from Ipoh to Butterworth usually are fully booked in advance before the festive seasons. To go to Butterworth from Ipoh by ETS train, you have to follow the Gemas – Butterworth – Gemas route. 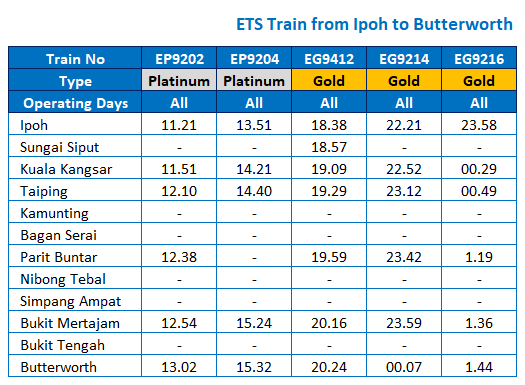 Click here to view the ETS train schedule from Ipoh to Butterworth via Gemas – Butterworth Gemas route, effective from 1st August 2017. The ETS train from Ipoh will depart from Ipoh Railway Station or KTM Ipoh Train Station. Ipoh train station is located in the city center of Ipoh. The train station itself is one of the attractions available in Ipoh, known for its history. The architecture of the building is unique because the British colonial administration built it when they came to Tanah Melayu (now Malaysia). To go to the train station, the most convenient way is to take taxi or book an Uber or Grab car service. The locals usually would have someone to send or fetch him or her from the train station. Alternatively, you can take the local buses. The closest bus station to the Ipoh train station is the Medan Kidd Bus Station, mainly used for the local buses going around within Ipoh and Perak. From Medan Kidd Bus Station, you only need to walk around 10 minutes to reach the train station. The arrival point for ETS train from Ipoh to Butterworth is at KTM Butterworth train station. Butterworth is part of the mainland of Penang. To go to Georgetown; the capital city of Penang, you have to take ferry or cross the Penang Bridge. From KTM Butterworth train station, taking ferry to Georgetown is easy because the train station is located near to the ferry terminal. Pangkalan Sultan Abdul Halim Ferry Terminal is just within 10-15 minutes walking distance away from the train station. There are signboards around the train station and along the pathway to guide you to the ferry terminal. Bring sweater or jacket or scarf with you because the temperature in the train might get colder for longer journey. Also, since ETS train from Ipoh to Butterworth is one of the popular train routes in Malaysia, you are advised to book your ETS train ticket in advance to avoid disappointment. Booking ETS train tickets at BusOnlineTicket.com is easy with secured payment environment.